Box Lacrosse is a version of lacrosse that is played on ice hockey rinks or indoor lacrosse arenas. The game was created in Canada as a way to take Canada's summer passion field lacrosse and its winter obsession Hockey and use the Ice hockey facilities in the summer time. Given Canada's obsession with hockey it is easy to understand how the game morphed into the version we see today which very much feels like hockey. Six players per side, one goalie and 5 runners. Positioned more or less exactly as a hockey team would be. Passes off the wall, quick transitions, free flowing shifts, and many of the components of hockey melded into the game of Lacrosse. There are two basic versions of this "indoor" game. I placed the word indoor in quotations, because truly the playing surface does not need to be indoors and there are many outdoor hockey and indoor lacrosse facilities that are truly outdoors playing surfaces, but now I'm confusing you. The bottom line is these games are played on much smaller surface that contains boards and look like a ice hockey rink with turf or carpet on it. 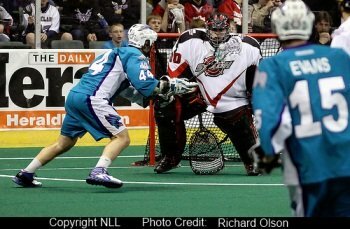 Box lacrosse also known as boxla is the Canadian version of "Indoor Lacrosse" played with 3 periods like hockey. It has its own rules independent of traditional field lacrosse. Indoor lacrosse uses standard field lacrosse rules and has four quarters like field lacrosse. It utilizes a modified rule book taken from the field game. Other than that for the most part, the games look similar in most respects. While indoor lacrosse once had 7 versus 7 players todays indoor lacrosse is played with 6 players same as Box, and the two games are for most intents and purposes the same. Box Lacrosse is played by men and women in Canada. The rules tend to be allow a more physical style of play. Cross checking is typically legal except in the back and on the boards. Different than hockey, contact into the boards is vigorously policed.